Panasonic AE900 is video projector based on LCD technology. This machine has been in production since October 2005 and completes Panasonic AE product line (AE500 and AE700) operating on 1280x720 resolution. It was succeeded by another 720p model PT-AX100 (2006) and PT-AX200 (2007). It was the last 720p flagship, as the full HD resolution model AE1000 was introduced in the end of 2006. This page contains a small FAQ section, a review (head-to-head comparison) of the device and rivalries in late 2005 and some concluding remarks of a longer term ownership. Even though projector usability has improved remarkably since the time of CRT projectors, these devices are still quite complicated and some knowledge is needed to fully utilize their potential. This small FAQ tries to provide answers to some initial questions about AE900 in particular. Information is mainly summarized from posts to AVS forum's AE900 threads and from finnish DVDPlaza forum's AE900 related threads. Big thanks for all active forum members for sharing your experiences! How can I assure that I've received a properly working projector? There are several things that may turn out to be defective, but there are few basic issues you might want to check as a rule. Use solid red, green, blue and black test images to find out pixels that are constantly on (or off). A test pattern helps a lot, but you can use OSD menu position to check how accurately three colours align throughout the image. Use solid white or light grey to see if the color constant from edge to edge. In case you have several dead pixels, convergence problems or discoloration, you will probably have to service your projector. The list was kindly provided by rwestley at AVSforum (message #2591). What's vertical banding or VB? If your picture appears amazing, you may not even want to know what VB is. That's because once you know what to look for, you may just find it, just like finding your favorite cereals in a new supermarket, on the other hand, you can't help noticing it once you know what it is. But in case you need to know... Vertical banding is an image artifact, a vertical stripe darker than the background usually occuring as several waves of same frequency. This can be an issue on some projectors, but it is not present in all machines. It may affect any of the three panels individually. Vertical banding can be detected best on light scenes when displaying uniform backgrounds, such as flat test patterns, gray skies, mist, or sand. It should also be visible in EXT Menu's panel adjustment option where it can also be reduced, but remember to adjust the flicker also (see Projectorcentral's tip on VB). The manufacturers are not giving out detailed information about the VB so the actual reasons for VB are not very well known. During spring 2006, no reliable information on the topic was available in the Internet, however I got some information from a peer HT enthusiastic, who had browsed the japanse pages on VB. According to him, two types of VB can that are attributed to the LCD panel. The first is called 'mura' and is considered a manufacturing error. In mura, the different layers that make up the LCD panel are mismatched in some way, resulting in a very small but systematic deviations that are visible to the eye. Units showing mura should normally be discarded. 'The other type is caused in the rubbing process, where the liquid crystals are aligned. This is a contact process, resulting in nano-size grooves in the panel, which will turn out as vertical lines, but much more random and noisy than the mura'. But this is not all. The same guy also reported that his own projector, serviced for considerable VB, was fixed by changing the motherboard (electronics). I've myself experienced increased VB due to prolonged stand-by mode, so it seems evident that VB can also originate from the electronics and not only from the LCD panels. How can I most easily set the lens shift? The joystick is inaccurate and makes it difficult to get the picture aligned with precision. I found it easier to tilt the projector body physically than to desperately wiggle the joystick back and forth. I first raised both 'legs' of the projector one revolution to get little headroom and then tried to get the joystick into a favorable position. And then I just lowered the legs to bring the projection to the right level. There are actually two distinct EXT menus. They contain few identical items. I'll describe OSD-EXT menu first, POWER-EXT menu then. In the Advanced menu, select OSD and hold down enter for three seconds. In the service menu you find Auto setup, HDMI hot plug, 525i SD, self check, flicker adjustment, panel adjustment and initialize options. I have no access for the documentation of the this menu functions, so the speculations below are based on my personal experience and vague assumptions. The flicker menu is used to minimize the flicker of each panel (R,G and B) and it is done individually for desk and ceiling image modes. Use a flat gray background video signal to make the setting easily. If you have convergence or ghost image problemsm you may want to use a convergence test pattern (a grid of some sort). Pay attention to the default settings if you make changes, the changes are saved automatically when you leave the menu and each setting. Panel adjustment can be used to reduce vertical banding. See what happens in each color chanel separately. If there is no visible banding, you will not see any difference even if you make changes. The self check menu is again quite odd. The displayed temperature is a reverse function of the actual temperature, so it is decreasing from 255 units. My screen shot has been taking after running the projector for one hour in low lamp mode at 23 degrees celsius room temperature. The most interesting addition to the OSD-EXT menu is the extended self check partition. Among many other items, it displays the dynamic Iris condition and the cumulative lamp run time, which is likely very interesting if you're buying a used projector. All options are described in the service manual. What signal type should I use with PC (VGA) connector? Several people have reported difficulties using the projector with a PC. This is due to insufficient number of compatible signal types (see Operating instructions, appendix) when using VGA connector. If your PC outputs 1280x720 (WIDE720), then you can use only 60Hz and the same goes for SXGA also (1280x768). If you use SVGA or XGA (1024x768) resolution, then more options are available. The automatical synchronization is unreliable, I recommend using application such as Nokia monitor test to accurately set sync for VGA input. If your hardware is up to it, the best result can be obtained by using 720p or 1080i/p HDTV output (you can still use VGA input of the projector). If that is not possible, look for another working combination in VGA/SVGA. I myself use Matrox G550 and ended up using WIDE720 @ 60Hz, but I'm not fully satisfied with the image, although the problem is with the poor cable quality. For some graphic adaptors you can buy a HDTV connector that uses a component video or HDMI plug. Which cable should I use for best picture quality? In general, you can use VGA, Component(YPbPr) or HDMI input to get the optimal 720p or 1080i/p input. However, when used with a DVD player, you will normally have choose between CINCH and HDMI. My own experiences and the Cine4home test referenced below show that component input is inferior to HDMI input in terms of picture artifacts and horizontal colour separation. Therefore, use HDMI to get a slightly better image, however, the difference is not big. How long will the lamp last? How to detect convergence issues ? Convergence refers to the correct alignment of three component channels of the image - reds, blues and greens. In order to get a sharp picture, all three channels must converge. Convergence can be tested with previously mentioned Nokia monitor tester, or alternatively using my convergence test pattern (PNG, 1280x720) (or PNG 720x480) . The idea is to ensure that all colors go nicely over each other. In AE900, the pixel grid is barely visible, but when looking at white lines on a black background from a short distance you should see - surpisingly - white lines. However, if your image does not converge, you might, for instance, see three lines. One white, one blue and one yellow. This indicates that the blue channel (and panel) is off the axis. Convergence problem can be horizontal, vertical or both and can involve one or two panels (third is the reference). How to fix convergence problems? Fixing convergence requires special tools and should be done by a qualified technician. Unfortunately, there is no easy way to fix panel misalignment. Panels are fixed to the LCD panel unit, which means that they can not be adjusted without an additional panel adjustment fittings set. Peaking inside the project and having read the service manual, I could not figure out the principle of how the set might move the panels. Additionally, you would need a service kit TZSH07018, which contains extension cables so that adjustment is even feasible. For my unit, I consider the lack of convergence adjustment the biggest problem after three years. How to clean the projector? In prolonged use, dust accumulates inside the projector. Depending on the surface where the projector eats the dust, there can be deterioration of image quality in terms of maximum brightness and local contrast. The standard operation for users is to keep the air filter clean, but even if done on very short intervals (50 h or less) it can not prevent dusting. In order to really get the projector less dusty than it was, you should disassemble it in a particle-free environment. Obviously you don't have a lab at home. The best you can do is to use your bath/washing room for this purpose. Remove all furniture and items and rinse walls and floors with water to flush out all dust. Block possible sources of incoming, dusty air set a working table (I used the washing machine). The procedure of opening the projector case and removing APC board is described in the service manual. Download it and print out page 15. Then proceed by first opening the projector and then removing APC board. Take care when removing cables and connectors. The LCD cabling connector has two small levers, one on each side, pull them out first before pulling the cable out of the APC board. Do not disconnect or unscrew any parts that are not required for this maintenance. The connector board can remain fixed to the APC for cleaning purposes. I also took out the LCD block. It is fixed by the screws, but otherwise comes out easily. There was amazingly a lot of dust on the surface of the red panel (possibly because it is closest to the intake and thus first on the way of internal "wind of dust"). I next used a compressed air from a can to blow the LCD panel and polarizing filters clean. When the LCD block is out of place, you can also clean the back lens of the projection lens. I did not try to dissamble the projection lens although there clearly was dust also inside that lens. Finally reverse the procedure and put the pieces back together. Take care to connect all wires back, it is quite easy as they are all very short and well marked. End result? I dare to say that the red channel looks now a bit sharper in the middle area. This is also quite conceivable because the corresponding panel had the most dust. However, I was not able to clean out all areas as well as I had hoped for, so I was not very pleased with the operation. Two independent sources (Cine4Home and AVBuzz) have determined that Cinema1 will provide the best color reproduction and accurate gamma (2.3) 'out-of-the-pack', without any tuning or using a filter. However, the maximum brightness is little less than in the other modes. Check out the suggested changes to this mode from AVSForum AE900 tweak thread. The next best shots you can get with Normal, Cinema 2 and NaturalNormal shows most contrast, has also a fairly reasonable gamma (2.4) and with a little color temperature tweaking (-4) it achieves proper color reproduction, often termed D65 color temperature tracking. 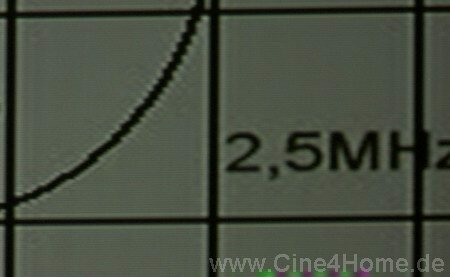 Cinema 2 (g=2.3) and Normal (g=2.4) have a decent color reproduction (CR) Stick to them if you don't know any better. Finally, Cinema 3 and Video modes will probably not be useful under any circumstances. All systems are different, starting from the projection screen, ambient light, surrounding walls, projector manufactoring tolerances and viewer preferences. You'll get the most out of your projector by calibrating it to your preferences, starting from one of picture modes suggested above. Including the service menu, you can usually benefit a lot by adjusting the picture to your viewing conditions. This can be done most accurately by using a measuring equipment (calibration hardware), which are not prone to deception like our eyes. However, this sort a tool is rarely available. so its you should stick to your own eyes and use a guide such as Digital Video Essentials DVD or AVID for assisting in the tune up. I heard that you can tune the projector by using an optical filter. What's that all about? First, LCD projectors still have problems with light escaping through a 'black' panel, which results the the parts of the image that should be black turn out to be gray. While the required black level depends on ambient lighting, it's a fact that LCD projectors don't provide as pure black as DLP projectors do. The manufacturers struggle this challenge by using different types of dynamic iris systems. However, this light leakage can be also compensated by using a filter that absorps the light to reduce the light intensity to a level that is at the edge of human photocopic vision and likely to be perceived always as true black. Of course, this option also reduces the maximum intensity of white, but fortunately there is some headroom in AE900 in both lamp modes, littel bit depending on your screen size and the preferred lamp mode. Another thing is that the white light spectrogram of the of the projector (Cine4Home.de) shows that the projector generates more blue and green than red. As was mentioned above, Cinema1 mode is already compensated for this difference, but brigther modes, such as Dynamic and Normal are not. So, if we choose a suitable filter, we can compensate for the characteristics of the light source by filtering out some wavelengths, or colours if you will, more than others. Although the joystick is easy to use and the mechanical shift provides a possibility to shift the image 16% up or down the projector level, be aware that the optics will introduce unwanted convergence problems to the edges of the picture if you push it to the extremes. The best picture quality is received in the center position. Convergence problems in the corners have also been observed with the zoom in tele position. If you have any 'headroom' in your installation, use a convergence test pattern to estimate possible problem. Yes. Several people at the AVSforum have reported that AE900 correctly recognizes and displays progressive movie material of 1080 coming in at 24 fps from a BluRay player (Playstation 3) connected to the HDMI input. These settings have been acquired with the aid of DVE DVD and the panel adjustment images of the projector, but they have not been confirmed by any calibration device, so I would not recommend them to anyone else. I've used MikeSRC's settings for 81EF as a starting point for these settings, as I didn't get very good results with Ckl's settings that in paper match my system better. Home projectors have developed rapidly during the last five years. For the price of a tiny LCD or medium-sized plasma display, you can buy a beamer that shoots up a 100' picture from a throwing distance of just 3m (just over 9 feet) with vivid colors and good contrast. Panasonic AE900 is one of those fifth generation projectors that take the performance of standard resolution TV and DVD to the its maximum. There are plenty of models to choose from when looking for a projector below 2500 USD. Before I decided to go with the new Panasonic, released in October 2005, I had a look at several interesting candidates including Optoma ThemeScene H57, Hitachi PJ-TX 200, Sanyo PLV-Z4, Panasonic AE-900, Sony HS-50 (2004 model), and InFocus ScreenPlay 5700. The new Epson Cinema 550 was unfortunately unavailable at the time of my exploration. These projectors are all descendants of a long-term product family and therefore quite finished products. I pretty soon found out that DLP was not for me. Although the technology has improved enormously since its arrival to home theaters in the late 90's the rainbow-effect sits still in the 'budget' class projectors. Also, in my opinion (and according to ProjectorCentral.com) DLP is currently losing the value-for-the-money battle as a DLP projector with the same resolution costs still almost 1000 USD more, but provides very little added value. When it comes to new LCD models, Hitachi, Panasonic, and Sanyo line up pretty closely. However, I found AE900 most suitable for my purposes. The Sony was discarded being too old and over-priced for this comparison, not that it would have stood much of a chance here. Panasonic AE900 has a different prefix depending on the market, 900E for Europe, 900U for USA and Canada and 900A for Asia and Australia, but the critical parts (panels, lamp and optics) are the same in all models, so comments provided here about AE900E should apply for other models also. That's because the only difference is in the power and video connectors. AE900 and TX-200 are quite similar to each other. TX-200 may have a bit more natural color reproduction out-of-the-box, but it has less ANSI lumens and a considerably poorer shadow detail. The colour in AE900 is possibly a bit over saturated, the manufactorer calls this property 'adjusted by the Hollywood colour experts'. Also it has the lowest number of input connections and makes more irritating noise than Panasonic to my ear, although the intensities are probably almost equal. Z4 is a bit controversial. It has few technical advances: it's practically silent, the lens is automatically 'protected' when not in use, dust can be blown off the LCD panels by user and it has probably the best and most flexible optics of these three. However, especially using the digital input (HDMI input, as in all), the SD picture, upscaled or not, the image appears too sharp. It doesn't either have as good blacks as AE900 has. Panny also continues to use the SmoothScreen technology, which almost completely eliminates the screen-door effect (gaps between pixels), that is visible in both Hitachi and Sanyo. Considering my relatively short throwing distance, little less than three meters, Panasonic provides the most movie like image, which I greatly appreciate. There are of course plenty of other details to consider, but I considered the movie image quality on (SD) DVD material to be the most important. Recently, more technical tests have also shown that Panasonic's image obeys very well to current color standards and it has accurate color reproduction and constant gamma of 2.3 in Cinema mode. These are the main reasons I choose Panasonic. There are naturally several reasons why you may not want to choose Panasonic, some of which are covered in the small projector FAQ below. After finally buying and installing the projector I'd like to bring up some issues that may be of interest to other actual and potential users of AE900. In addition to AE900, the video image system of my home theater comprises of Samsung HD-745 upscaling DVD player connected to the projector with 10m (33ft) HDMI (ITEC, with no-brand DVI-to-HDMI adaptor) and component (Hama) cables and projecting to a neutral gray 80' DIY screen with gain of approximately 0.8. Installing the projector is fairly easy. The automatic signal detection works well and the projector can be operated by simple pressing Power on and off. The zoom and focus rings move smoothly and accurately, although the focus ring tends to turn a little as a put back the lens cover, but I'm least content with the joystick that operates the lens shift. I had some trouble with getting the image to fill my screen from corner to corner, as even a small movement of the stick pushes the projected five centimeters to each direction. Vertical direction seems to be even more difficult than horizontal. I've suggested a quick fix in the small FAQ below. Another stupid feature is the factory default setting for overscan (overscan = on), which was very annoying as any reasonable person will want to turn this off. Photos of DVE test patterns using either composite (YPrPb) or digital (HDMI) input. In both pairs, HDMI image is below. Notice the lack of color separation on higher frequencies. There are clear effects of diminishing resolution on the analogical signal to be observed. Video levels in the pictures have not been adjusted and there is some optical distortion due to camera tilting, but I assume that the message is quite clear. Also, the best sharpness is provided by 720p, so I would recommend HDMI over YPrPb for the primary video source, but keep in mind that a bad HDMI cable may turn out to be worse than a high-end CINCH, which my CINCH cable clearly was not. Another controversial topic is the remote control. It has some nice features, but doesn't work as well some programmable and pre-programmed RCs. For instance, the only manufactorer code that worked for my Yamaha receiver messes up some function buttons and my Samsung DVD player was not recognized at all. Also the logic of selecting an equipment to be controlled is little bit strange and the lack of a 'transmission LED' is devastating. I personally have a hard time operating the 'arrow' buttons, which are all under the same rubber cover and often seem press to wrong ones. On the positive side, the background light works fine and RC uses two AA size batteries, which is nice. Several usability and technical quality issues have been already highlighted. In general, the user interface in the menu is quite well organized. Only problem in interfacing comes the remote control's tendency to go to the wrong direction. Also, I would have like'd to see some items that are now in the EXT menu as regular menu items, because they're very helpful in setting up the projector. As a conclusion, the projector works as I expected and provides an extremely good picture quality. I may have been lucky to get a fully working projector with no dead pixels, no colorization erros, no panel misalignments and with little vertical banding. Is vertical banding bothering (if you don't know what it is, see the small FAQ) ? Not really, you don't see it very often and after making panel and flicker adjustments it is reduced, although still visible. It also seems to only affect the green channel or panel, but is so faint that the photo of the green adj.screen (see below) doesn't show it. Actually, if the image quality would be any better, I don't think I'd like to watch any standard resolution (SD) material at all, as the MPEG artefacts and low-resolution issues are quite visible even now.